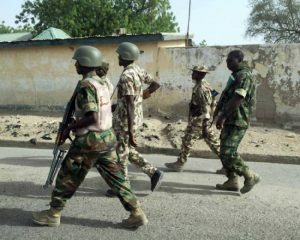 The Nigerian army said soldiers on internal security operations in Taraba State have arrested two persons suspected to be the masterminds of recent attacks in that state. The suspects, Danasebe Gasama and one Danjuma a.k.a. American, according to the Director, Army Public Relations, Brigadier-General Texas Chukwu, are responsible for the killing of Fulani and locals in the area. Chukwu, in a statement said the two were arrested in Takum following intelligence report. The statement made available to Sunday Sun, reads; “Troops on exercise AYEM AKPATUMA on 12 April, 2018 arrested two persons, Mr Danasebe Gasama and Mr Danjuma a.k.a. American, in connection with the killings and uprising in Takum and Ussa Local Government Areas of Taraba State. “The two suspects were arrested at Takum following an intelligence that they were the coordinators of several attacks both on Fulani and the locals. “The general public is advised to always give useful and timely information to security agency for prompt action.